Help us build our Woodland Cookery School! 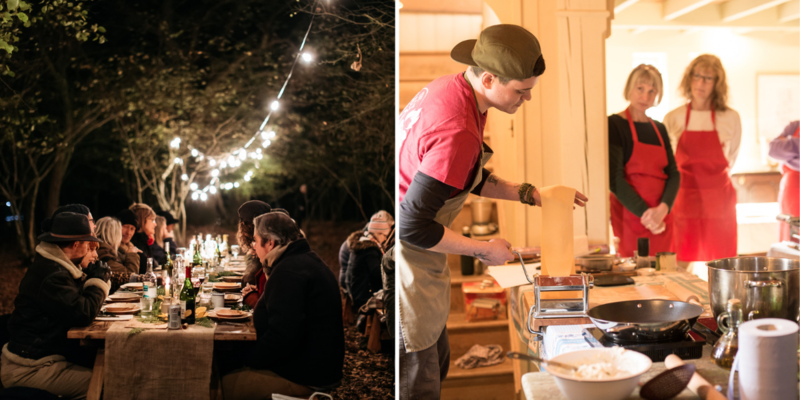 The Salt Box is a celebration of seasonal food and open-fire cookery through the coming together of people beneath the trees, creating delicious food from nature’s humble ingredients. Founded in 2017, we are sustainably minded cooks dedicated to curating unique and unforgettable dining events and cookery workshops in and around the South East of England. For the next chapter of The Salt Box, our goal is to design a woodland site for us to open Surrey's first outdoor cookery school in early Summer 2019, based in a beautiful woodland spot on the Priory Farm estate in Nutfield. Teaching small groups how to cook over open fire, taking children and adults alike on a journey to discover the immersive world of the great outdoors and encouraging a life in meaningful contact with nature, beneath the trees surrounded by wisps of smoke and the crackle and pop of the fire.  Up until now, we have run a ‘nomadic’ business, curating events and courses in a variety of venues, from farmer’s fields to breweries, sculpture gardens to vineyards. We are now ready to ‘put down roots’ to begin the next stage of The Salt Box. Our Woodland venue is not just about learning to cook a delicious meal. Exposure to the great outdoors has great potential to be a protective factor for the mental health of our young people and adults. All of our events and courses will encourage the coming together of people in a natural environment through a shared love of food, ever-more important with friendship becoming a lost art in our increasingly time-poor, high tech world. What type of courses and events will we run? We want to invite children and adults alike to join us in the woods and return to nature and the source of our food, through traditional techniques, craft and wood-lore. Learn the art of cooking with fire and smoke, cooking a seasonal feast to enjoy around our communal table. 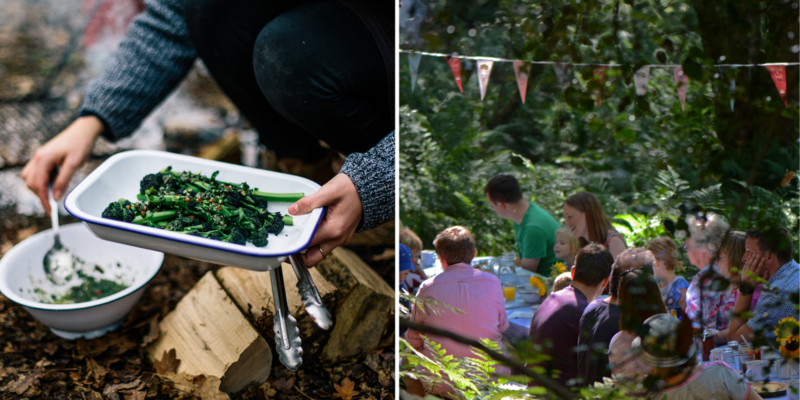 Our dining events will also be aimed at both adults and children, bringing people together around our shared dining tables to enjoy seasonally inspired, local food cooked over fire in our open-kitchen beneath the trees. Private tuition, corporate and group courses will also be available upon request. "The whole event was amazing. I loved every minute. The hosts were fabulous. I had an amazing day. I have since made pasta at home and one of the sauces. Can't rate it high enough. I have told everyone to take a look." - Sarah S. (Pasta Workshop). We will build a round(ish) house for our Woodland HQ, to protect us from the Great British Weather and allow us to run open-fire cookery courses 365 days a year. It will be built from a combination of repurposed telegraph poles and tree trunks, topped with a bespoke canvas cover with clear panels for extra lighting. We will use removable hazel hurdle walls to protect from any strong winds and rain during the winter, but allowing us to open up the sides of the shelter during the spring and summer. Under the canopy, we will also build a woodland dining table and storage. We will build a bespoke cob kitchen in the woods. Cob is a mixture of clay, sand and straw, this will form our building material and once dry will form an incredibly strong kitchen which can handle high temperatures. 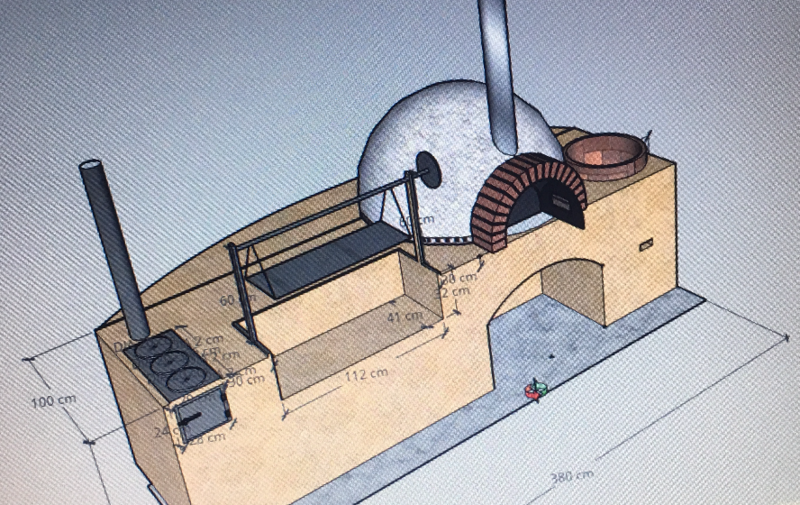 Pizza oven for baking, roasting… and most importantly, pizza! Tandoori oven for cooking super hot and super fast. The tandoor will also be designed so that we can hot and cold smoke within it. Bespoke iron components to be forged by a local blacksmith. The funds will primarily go towards the materials to build the kitchen, all of the labour will be done by us (with help from trusty friends and family!). Our little white van (otherwise known as Norbert) is just not going to cut the mustard up in the woods. We will need an all-terrain vehicle to access our woodland location, along with a trailer for any larger pieces of equipment. This will be purchased second-hand. We also wish to brand our vehicle to make us stand out from the crowd and strengthen our brand identity. We need to stock our cookery school with lots of cookery equipment, including utensils, bowls, pans, skillets, sieves, trays, knives and lots more. We want to take our Cookery School on tour! By purchasing portable fire-bowls and equipment, we can pack everything into our trailer and take our open-fire courses to schools, festivals and country fairs. Our pop-up cookery courses would be able to teach 12-14 people per workshop. We will build a ‘glamorous’ compost toilet, so that guests can use the facilities without having to walk back to the barn. It’ll be a loo with a view, overlooking the Surrey Hills. To make our dream a reality, we really need your help. To help fund the set up of our Woodland Cookery School, we have just launched a rewards-based Crowdfunder campaign. We have a wide range of rewards available, from Salt Box t-shirts and tickets to our very first Afternoon Tea in the Trees, to a very special woodland supper just for two. We really appreciate any support you're able to give. And if you're not able to support us financially, but you like the sound of what we plan to do, please help us spread the word by sharing our Crowdfunder Campaign on social media! 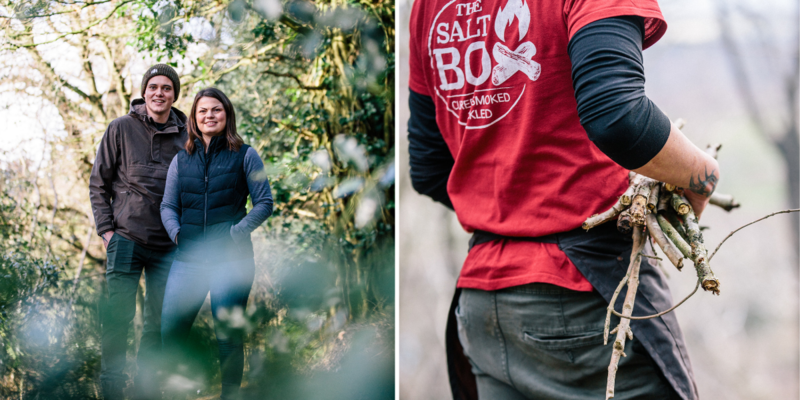 Born in Autumn 2017 out of a passion for local produce and seasonal ingredients, The Salt Box set out on an adventure to bring people together through food and fire in and around the South East of England. The brainchild of partners in crime Beckie and Christian, the duo have strived to build a business focusing on local, sustainable and seasonal ingredients, surrounded by the outdoors and crackling fires. Eager to reconnect people with what’s on their plate, they have welcomed over 2500 diners at 95 events, through supper clubs, private/event catering and cookery courses, all over the past 18 months whilst both working part-time on other projects. The team have always been driven by supporting local farmers, growers, artisans, craftsmen and businesses. There is an undeniable power in the collective, which is why they’ve collaborated with over forty local businesses since day 1. At the core of The Salt Box is a loyal customer base, which is testament to their growing community of locavores - which in turn contributed to them winning Surrey Life’s Newcomer of the Year 2018 award. In November 2018, they were also awarded the Surrey Hills Trademark. Find out more about the team at https://wearethesaltbox.co.uk/our-story/. Get on the exclusive guest list for our official opening night. We'll be celebrating our new Woodland venue with a four-course feast over fire with wild cocktails, enjoyed around our signature dining tables, with a few surprises thrown in! Please note this event will take place in the evening on Friday 14 June 2019. This is for two people. We will add your name to the 'wall' of our cookery school, propelling you into legend status on Surrey's food scene! A signed copy of the upcoming 'Surrey Cookbook', which we are featured within along with over fifty other local incredible food and drink businesses from Surrey. Pick up from Nutfield or any Salt Box event only (upon request). Be the first to get your hands on The Salt Box Signatures, a trio of tasty treats including our Chilli Jam, Chilli Fennel and Orange Rub and our Beetroot, Horseradish and Caraway Seasoning - all in a Salt Box branded tote bag. Pick up from Nutfield or any Salt Box event only (upon request). Get your very own Salt Box t-shirt for your little ones! All of our t-shirts are EarthPositive®, the most progressive sustainable clothing on earth, produced exclusively from organic cotton. You'll also get a flint and steel, the perfect fire-starter for your little ones. Pick up from Nutfield or any Salt Box event only (upon request). Get your very own Salt Box t-shirt! All of our t-shirts are EarthPositive®, the most progressive sustainable clothing on earth, produced exclusively from organic cotton. Remind yourself of The Salt Box daily with this branded enamel mug that you can carry with you wherever life's adventures take you, along with a branded Tea Towel featuring our beautiful illustrations. Pick up from Nutfield or any Salt Box event only (upon request). Join us beneath the trees for our Family Wild Things workshop - including wild cookery, a seasonal feast and natural crafts session - suitable for children and adults alike. This reward is for 1 adult + 1 child (7+) ticket for the event taking place on Thursday 30th May (Half-Term) - 10:30am - 3:00pm. Perfect for the adventurous family! 1x Adult T-shirt, 1x Kid's T-Shirt, 2x Enamel Mugs, 1x Flint & Steel, 1x Tea Towel and one glorious marshmallow toasting fork! Pick up from Nutfield or any Salt Box event only (upon request). Be the first to snap up tickets to our very first Tea in the Trees, for a wood-fired afternoon tea, paired with wild cocktails and enjoyed around our shared dining tables in the great outdoors. This pledge is for two tickets, for our first event that is scheduled to take place on Sunday 30th June 2019. Learn the art of cooking with fire and smoke with local, seasonal and sustainable ingredients, focusing on wild game and all-things feather and fur, from rabbits and squirrels to pigeons and pheasants! This course will take place on Thursday 3rd October (10am - 4pm). Be the first to book your space on our Wild Game Butchery and Cookery course - which will take place on Wedn 26th June (10am - 4pm). Learn the art of cooking with fire and smoke with local, seasonal and sustainable ingredients. Be the first to book your space on our Introduction to Cooking over Fire cookery course - which will take place on Friday 7th June (10am - 4pm). Join us beneath the trees for the creme-de-la-creme of dinners, an exclusive evening just for two. A seasonally inspired five course seasonal feast, cooked over an open fire, enjoyed with a bottle of Albury Vineyard's sparkling Organic Classic Cuvee. 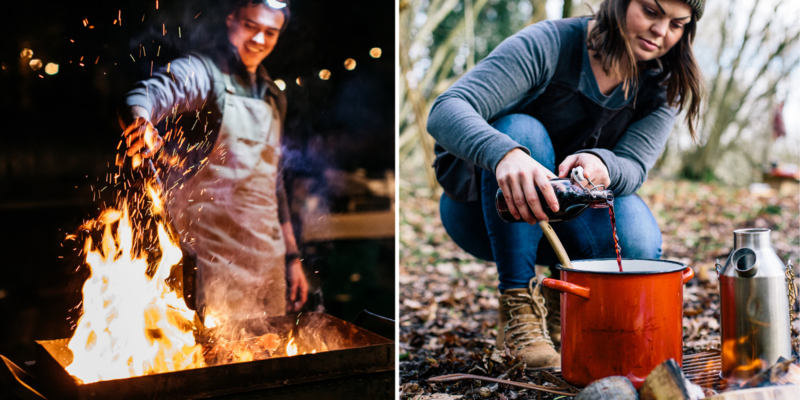 Join us in the woods for an exclusive open-fire cookery course for four guests. Choose from our range of locally and seasonally inspired courses (half-day). Please note this reward must be redeemed by June 2020, and is only redeemable on weekdays. Join us in the woods for an exclusive private feast over fire for a group of 10 guests. Enjoy a locally and seasonally inspired five-course meal at our woodland location in Nutfield with wild welcome cocktail. Please note this reward must be redeemed by June 2020. Subject to availability. 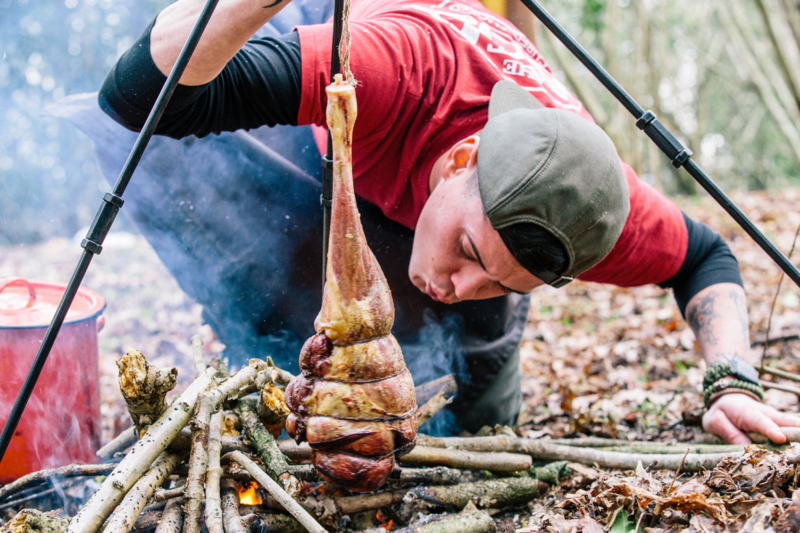 Join us in the woods for an exclusive open-fire cookery course for four guests. Choose from our range of locally and seasonally inspired courses. Please note this reward must be redeemed by June 2020, and is only redeemable on weekdays. Become our ultimate Salt Box hero. Help us raise £15,000 in one fell swoop and you'll receive your very own Salt Box Superhero cape!